The DESC210 Race Ready RTR from Team Durango is an out-of-the box racing Short Course truck. World Champions Team Durango are Serious About Racing and now, after months of development and testing, we are proud to bring you our Race Ready RTR 2WD off-road SC truck. Complete with Electronic Speed Controller (ESC) and 13.5 brushless motor from World Champions ‘Speed Passion’, Team Durango’s RTR DESC210 is ready to race, and win, from the moment you take it out of the box. Team Durango Race Ready RTR trucks are an ideal introduction into the amazing and exciting hobby of RC car racing. 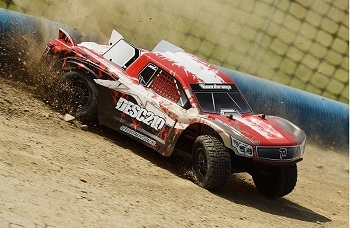 If you think you have what it takes to win, then the DESC210 Race Ready RTR is the truck for you! Two years. From idea, through prototype to production; the DEX210 took two years to become a reality. A Team Durango car is born with a theory. That theory then becomes a hand-built prototype in our laboratory in Germany. Hours are spent, milling, drilling and machining bespoke parts. Days and weeks are taken to create and re-create parts, modifying them and then testing them. Then a handful of prototypes are made and race-tested by our team of international pro drivers. With their expert feedback we refine the design and create more prototypes. This cycle continues until we make the best possible car we can. The unique Hybrid Design gearbox by Team Durango means that the DESC210 RTR is the only Short Course Truck available that can be configured to be mid- or rear-motor without the need to change suspension set-up or use another gearbox mould. It is also the only gearbox design that can use three or four gears to allow the motor to sit on the left- or right-hand side of the car. The DESC210 RTR is rear-motored out-of-the box, but optional parts are available to convert your DESC210 RTR to mid-motor configuration. Team Durango has shown how fast and strong our oil-filled geared diffs can be. Made famous in our World Championship winning Pro-level spec 4WD racing buggy, the DEX410, Team Durango’s oil-filled geared diffs are robust, tuneable and easy to maintain. Hard-anodised, oil-filled, shock absorber bodies made from machined alloy, with big bore coil-over springs let your DESC210 RTR soak-up all of the bumps and jumps on your race track. With optional Team Durango oils and springs, you can fine-tune your Big Bore shocks to suit any track surface and condition. Just like the Pro-spec DESC210R kit, the DESC210 RTR has captured CVD (constant velocity drive) driveshafts, which means that the drive pins sit inside the ball-bearings. This greatly reduces the chances of mechanical failure which means you spend more time on the track, racing and winning! Off-road trucks need a smooth power delivery to keep them stable under acceleration. By adjusting the slipper clutch, you can set the perfect amount of slip before the drivetrain engages the wheels. Whether your racing track is high-grip or low-grip, the dual pad slipper clutch can be adjusted to make driving the DESC210 RTR much easier. The front and rear geometry of the DESC210 RTR has been designed, tested and proven over many months. The Championship-winning design has proven to be successful in the hands of our Pro Team drivers and club racers all around the world. The geometry on the DESC210 RTR is the same as that on the DESC210R Short Course Truck kit. With a few, selected optional items, your DESC210 RTR rear-motor Short Course Truck can be converted to a mid-motor truck in minutes. Why would you want to do this? Well, mid-motor RC vehicles are better on tight, high-traction surfaces. The DESC210 RTR is the only RTR truck in its class that can be converted from rear-motor to mid-motor (and back again) without the need to change the suspension set-up or gearbox mold. If you like this article, check out this additional article on Team Durango.